But there’s one sure way to squelch that feeling of dreariness — coming home to holiday lights. My husband loves the holiday season and is full of the Christmas spirit. One year, he was feeling particularly festive. He put lights on nine spruce trees in our yard, hung roof line lights on the gable peaks and along the lower roof line. He even hung large snowflake lights from the tall oak trees in our front yard. Each time I pulled around the corner that brought me to the entrance of our home that year, I couldn’t help getting excited. 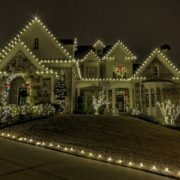 The anticipation of seeing our home lit up with those beautiful lights made me instantly happy! It brought a smile to my face every single day! Do Holiday Lights Make You Happier? Was I really happier? According to psychologist Deborah Serani, it’s true. Decorating can definitely lift your mood. In a 2017 Today.com article, she is quoted as saying, “It does create that neurological shift that can produce happiness. I think anything that takes us out of our normal habitation, the normal day in, day out…signals our senses, and then our senses measure if it’s pleasing or not. Outdoor decorating doesn’t just bring joy to the homeowner, it helps brighten the mood of the entire neighborhood and sends a message of good tidings at this special time of year. 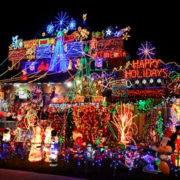 Some neighbors even enjoy getting into the decorating act together with themed lighting displays. The bright lights peeking through mounds of snow is diffused and creates an entirely different look. 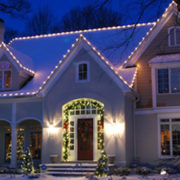 Many homeowners want the benefits of outdoor holiday lights without the risks it poses for hanging them on their own. 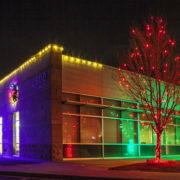 A professional holiday lighting installer can create a beautiful design that brings you and your neighbors that magical experience without the hassle. Christmas Decor by Arvidson offers a complete turn-key service that includes design, installation, maintenance, and storage. 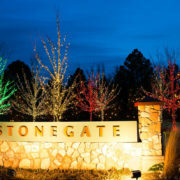 We can help create happy memories this holiday season with a custom holiday lighting display created just for you! 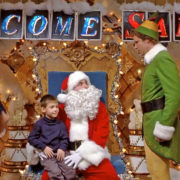 Holiday Lights are a Favorite Family Tradition Grinch or Cindy Lou Who? Which One are You?